I had the pleasure of interviewing Roderick for my research for Amish Quilts: Crafting an American Icon about his role as a quilt dealer in the 1980s. Although Kiracofe and Kile did not specialize in Amish quilts, they bought and sold many of them, and convinced corporate buyers of their significance. 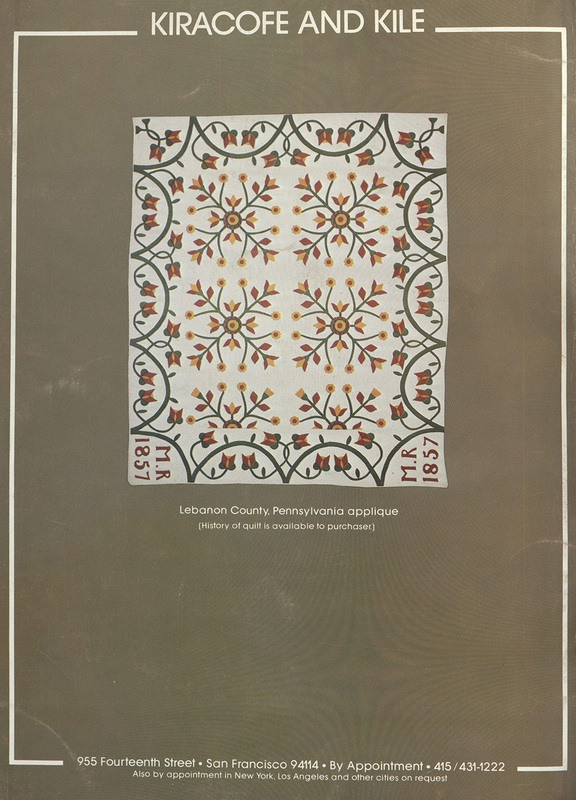 In fact, the first substantial article I read about the Esprit Amish quilt collection was by Michael Kile, published in the 1983 Quilt Digest. The accompanying images of Esprit’s corporate headquarters filled with Amish quilts helped me build my argument about Esprit’s vital role in the promotion of quilts as art objects. Advertisement for Kiracofe and Kile, placed in The Clarion in 1981. Over 20 years since those early days of quilt dealing, Roderick began to think about quilts again, particularly that unwritten rule that no good quilts were made after 1950. With the assistance of eBay, he discovered an untapped treasure trove of these forgotten quilts, the ones that American quiltmakers continued to make even after the heyday of the twentieth century’s first quilt revival, and into the second (ongoing) revival. Roderick’s eye was as good as ever, now tuned in to the graphic playfulness, unexpected fabrics and colors, and rule breaking that some quiltmakers in the second half of the twentieth century seemed to embrace. 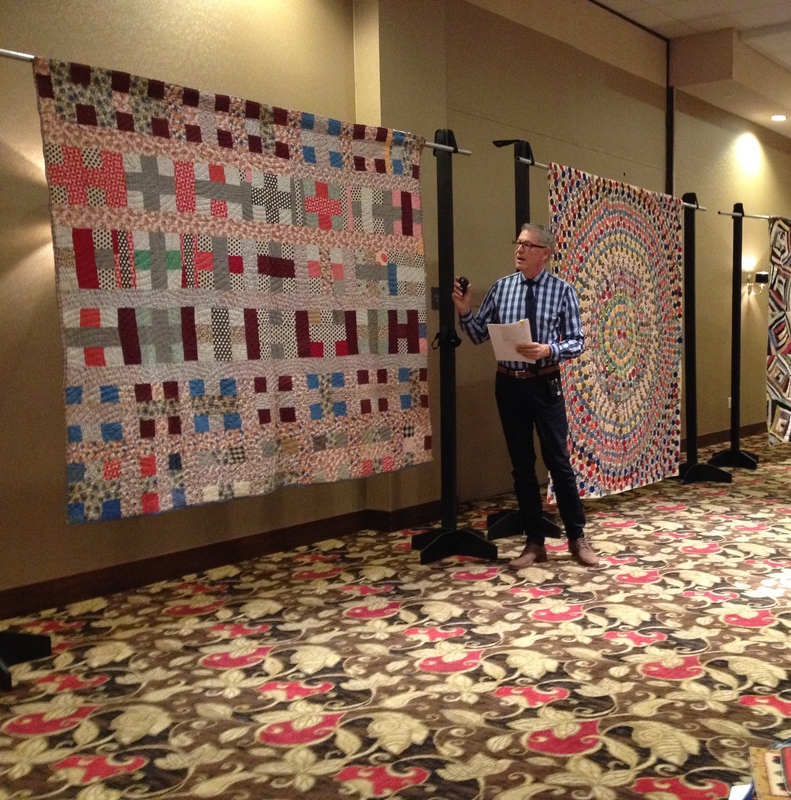 Kiracofe chatting about a few of his quilts at American Quilt Study Group seminar, Milwaukee, September 2014. Roderick has amassed an amazing collection that he has now shared with a lucky viewing public in Unconventional and Unexpected: Quilts Below the Radar, 1950-2000 (STC Craft, Melanie Falick Books, a division of Abrams). Unlike the all-star collections of an earlier generation dominated by pristine master quilts such as Baltimore Albums, high-style chintzes, and Amish center diamonds, this collection features quilts you might even imagine sleeping under—the kind of quilts your grandma maybe had, if your grandma didn’t like to play by the rules. These quilts recycle fabrics, integrate unexpected scraps (the negative space left from cutting trouser legs, the acetate lining from a hat, polyester double knits in every shape and color imaginable), and surprise us with innovation and quirkiness (does that cat have a mustache? Is it smoking?). They induce laughter, wonder, and amazement. I am thankful that Roderick bothered to ask, “What sorts of quilts were people making in the second half of the 20th century?” Like all collectors, his resulting collection does not account for the full array of quiltmaking practices, but it focuses on a certain unheralded subset: quilts by makers who didn’t care about published patterns, interior design trends, or juried competitions. These quilts have also changed the way I think about quiltmaking. In my academic study of quilts, I learned that in contrast to the commonly understood “scrap-bag myth,” American quiltmakers did not usually make quilts out of scraps of old clothing but instead usually bought new fabric for this purpose. I think that by the mid-twentieth century, Americans commonly believed this myth of piecing quilts together from scraps of fabric to keep one’s family warm to the extent that many women in fact began recycling old fabrics into quilts, embracing the myth as reality as it allowed them to creatively create something out of nothing. 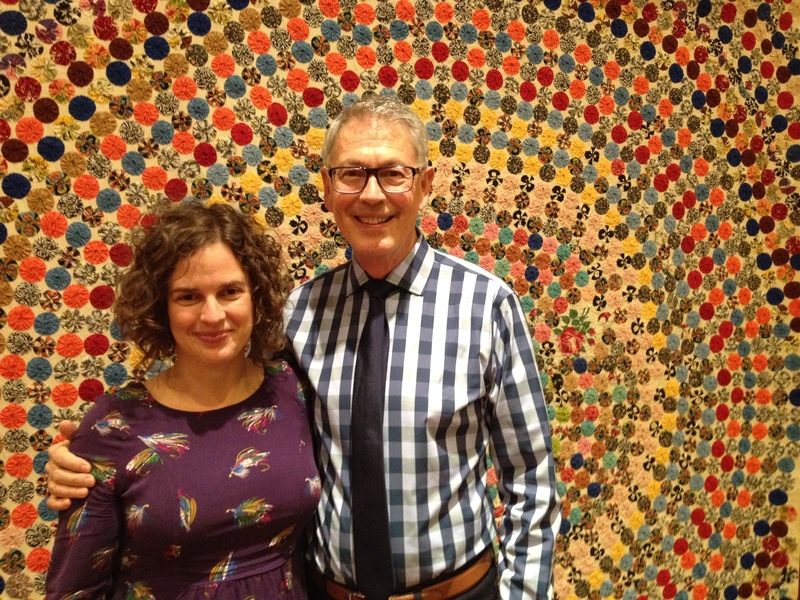 Roderick Kiracofe and Janneken Smucker sharing a moment in front of approximately one billion yo-yos at American Quilt Study Group seminar, September 2014. Unconventional and Unexpected not only is gorgeous in its design—the top notch photography by Sharon Risedorph and Josef Jacques makes these quirky quilts just glow, as does the design by Sara Gifford—but it also proves to be a delight to read. Roderick’s introduction sets the stage by contextualizing the quilts within his own personal story, and then 10 essays by artists, curators, quiltmakers, and scholars (including “Unconventional Wisdom: The Quilts and Myths that Came Before,” by yours truly—thank you so much, Rod, for the invitation) provide a diverse array of perspectives on these objects. I hope you join me in looking, reading, and thinking, and then behold these quilts as completely unexpected, yet just what you’ve been looking for.